The Afsluitdijk is protecting the Netherlands from the sea for more than eighty years. However, the dyke no longer meets the current requirements for flood protection. Rijkswaterstaat is therefore going to reinforce the Afsluitdijk. The body of the dyke will be widened and raised by about 2 metres and the cladding on the outer side will be replaced. Concrete blocks will be placed over the existing basalt blocks on the lower slope. These 'Levvel blocks' weigh 6,500 kilograms each and have a wave retardant effect. Because of their symmetry and the regular way they are positioned, the blocks have a tranquil appearance that reinforces the austere and autonomous character of the dyke. Every block will be GPS chipped, making them easy to inspect and maintain. The sluices at Den Oever and Kornwerderzand will be reinforced and flood locks will be built in front of the navigation locks on the Wadden Sea side. These storm surge barriers can be closed in extreme weather conditions to protect the navigation locks from the force of the water. To allow more water to be discharged from the IJsselmeer into the Wadden Sea, extra sluices and a pumping station will be built at Den Oever. The fish friendly pumps are low energy and are powered by renewable energy from solar panels on the Afsluitdijk. It is an icon of our country. A structure spanning 32 kilometres one that has kept the Netherlands safe for over 80 years. That is something to be proud of. A wonder of the modern world, made of millions of cobblestones. Laid one by one by thousands of hands. It was built to keep the sea out and to create additional arable land. The water will always try to reclaim The Netherlands. By building our dikes, we the Dutch, have made it possible to live below sea level. To ensure our future safety we are reinforcing the Afsluitdijk. Once on every 10,000 years a storm can hit unlike any other. That is what the dike will protect us from. In order to drain excess water from the IJsselmeer into the Wadden Sea we are building what will be Europe’s largest pumping station within the dike, which will be ready to pump out water should the need arise. 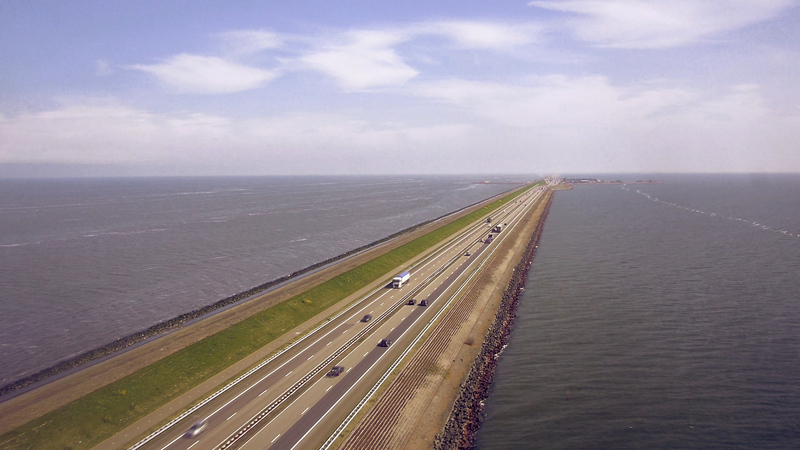 The Afsluitdijk will become a place where safety goes hand in hand with unique innovations. A place where we strive towards achieving sustainable energy. This is where we will harness the inexhaustible power of the current. And we are the only nation in the world that generates electricity from the convergence of freshwater and saltwater. We will be helping our wildlife too with the creation of the Fish Migration River. Fish will be able to reach their natural spawning grounds and habitats. This is what we are capable of: a large-scale, hydraulic work of art that is ready for the future. And that future starts here, in 2017 with the construction of the New Afsluitdijk. The Afsluitdijk is from great value for the Netherlands and is being used for safety, traffic across the roads and waters, cultural history, recreation and more. Read more about the importance of the Afsluitdijk. In 1916, a combination of a storm at sea and an enormous surge of water from the IJssel caused flooding in large parts of the area around the Zuiderzee. Read more about the history of the Afsluitdijk. Rijkswaterstaat will be strengthening the Afsluitdijk causeway in the years ahead to continue protecting the Netherlands in future against the power of the water. Read more about the Iconic Afsluitdijk.